Previously unreleased documents acquired by Techdirt show, fairly conclusively, that Congress will be making a huge and dangerous mistake if it moves forward with changing how the head of the Copyright Office is appointed. And despite the fact that the RIAA & MPAA are eagerly supporting this change, the people it will hurt the most are content creators. Because the Copyright Office is basically incompetent when it comes to modernizing its technology. That's what was found by a thorough (but not publicly released) Inspector General's report, detailing how the Copyright Office not only threw away $11.6 million on a new computer system that it said would cost $1.1 million, but also lied to both Congress and the Library of Congress about it, pretending everything was going great. In reality the project was a complete and utter disaster. It was put together by people who seemed to have no clue how to manage a large IT project, and there was basically zero effort to fix that along the way. After literally wasting $11.6 million on nothing, the entire project was scrapped in October of last year. The timing here is important. October is when Carla Hayden reassigned Maria Pallante, effectively firing her. Pallante had led the Copyright Office since 2011 (soon after the big project began), so she was in charge through the vast majority of this disastrous project. While legacy copyright folks tried to spread evidence-free conspiracy theories about why Hayden fired Pallante, it seems a lot more likely that it was because Pallante had overseen a project that flat out wasted $11.6 million, and during the course of the project the Copyright Office repeatedly lied to the Library of Congress about its status. But here's the astounding thing. Congress is trying to reward the Copyright Office for this scandal, and give it more power and autonomy despite this absolute disaster. Perhaps because, until now, the Copyright Office has been successful in keeping this whole thing hidden. As we've mentioned, Congress is effectively trying to move the Copyright Office out of the Library of Congress by having the new Register of Copyright (who heads the Office) be appointed by the President and approved by the Senate (i.e., making it a political appointee), rather than be appointed by the Librarian of Congress as has been the case since the creation of the Copyright Office. One of the key arguments in favor of this is that the Copyright Office is woefully behind on technology, and needs to be modernized. Almost exactly two years ago, a fairly scathing report from the GAO came out about the lack of leadership on IT issues from then-Librarian of Congress James Billington. Thankfully, Billington is gone and Carla Hayden is in charge now -- and she actually has a history of modernizing a library. Reports from folks at the Library say that Hayden has moved quickly to establish a real modernization plan for the entire Library, including the Copyright Office, and that those efforts are already starting to move forward. [The Copyright Office] did not follow sound [Systems Development Life Cycle -- SDLC] methodologies which resulted in it scrapping the eLi project development after six years and $11.6M in project expenditures. The eLi project began in 2010 with a budget approval of $1.1M, and increased to approximately $2M for full implementation in 2012. Ultimately Copyright spent over $11.6M through 2016 when it decided to terminate the contracts and abandon development activities. During that six-year period, Copyright continued to report in eLCplans (the Library's performance management system) that eLi development was occurring near or on schedule. Copyright executives at that time did not disclose in the Library's performance management system (eLCplans) and annual Congressional Budget Justifications the magnitude of issues and cost overruns related to the project. As a result, Congress and Library executives did not have adequate information to timely act on and address the issues. Again, forget those conspiracy theories about Pallante getting fired. Lying to your bosses in your annual budget requests about the status of a massive technology project that was way behind and way over budget certainly seems like a fireable offense. A big part of the problem? What appears to be near-total incompetence by the Copyright Office in putting together and managing the project. The USCO project management team did not demonstrate effective, proactive project cost management practices. Over the six-year development period, USCO project management expended $11.6 million in vendor costs. The USCo project management team received specific funding for approximately $1.9 million in the first two years of the project. USCO project management did not update project budgets for the subsequent six years of development activity, nor perform an analysis of estimated cost overruns. Subsequent development funding activites ocurred, inconsistent with initial funding requests. As discussed below, the USCO had no management body to evaluate and approve additional funding requests in conjunction with experienced development delays, analyses, and recommended courses of actions. Additionally, the USCO did not have an oversight body with authority to halt project activites based on cost overruns, delviery delays, and/or lack of functionality until appropriate remediation plans or project management structure was in place. Basically, the ship was almost entirely rudderless when Pallante was in charge. Ask for $1.9 million, spend $11.6 million -- without getting a working system -- and no one seemed to check on any of it. No comprehensive project management plan for the executiion and monitoring of the project. And, again, that's just some of the problems listed in the document. There are more. 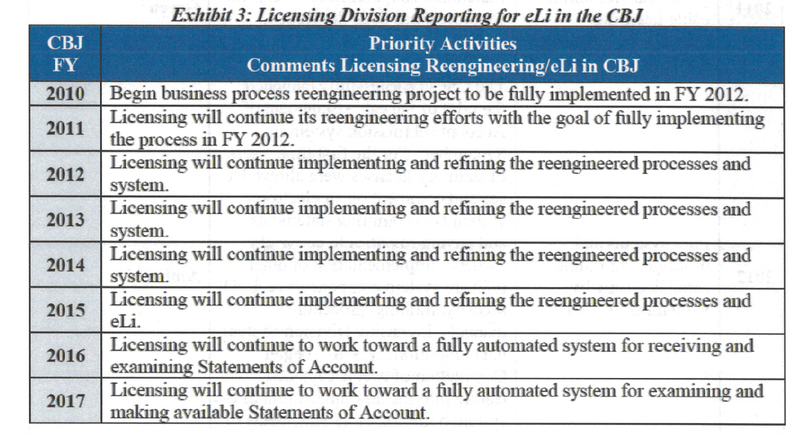 If you can't see that, basically every year all the Copyright Office said was "licensing will continue implementing and refining the reengineered processes and system" (or, in the past two years, that "licensing will continue to work toward a fully automated system for receiving and examining Statements of Account"). This despite the fact that the project was way over budget and apparently totally non-functional. The report also includes the Copyright Office's internal reporting to the Library, in which it needed to give a status report in one of three color codings: green if the project was on-track, amber if it was behind target but adjustments could result in accomplishing the plan on time, and red if it would not meet the annual target. Given what we know now, these should have been red every year. Instead... in 2011, 2013, and 2015 the Copyright Office reported "green." In 2012 it reported "amber." In 2010, 2014, and 2016 the Copyright Office didn't even bother to report on this project status at all. The most amazing thing here is that Pallante wasn't fired years ago for this complete disaster of a project. But the more important question right now is why would Congress be looking to give the Copyright Office more autonomy when it's quite clear that the Office has absolutely no competency when it comes to modernizing its system, and there has been a six-year pattern of throwing away money without a properly managed plan and a longstanding practice of lying about it to Congress itself? Last week, despite all of this, nearly the entire House Judiciary Committee voted to let this happen, and all I can ask is what were they thinking? Why is Congress -- and Reps. Bob Goodlatte and John Conyers in particular -- rewarding this behavior? At the request of the Library of Congress' Inspector General's Office, we have made a few small redactions to parts of the report that were not related to this story above. Someone left the loghts on in a storage room at the copyright office. Clearly the only solution is to remove copyright from the constitution.